Plans for a three-floor Enterprise Centre in Chesterfield, as part of the Northern Gateway scheme, have been recommended for approval. Chesterfield Borough Council wants to build the centre on part of the Holywell Cross (Donut) car park to meet demand for office spaces to house start-up and growing small businesses. If approved, work would start in March 2019 and take a year to complete. 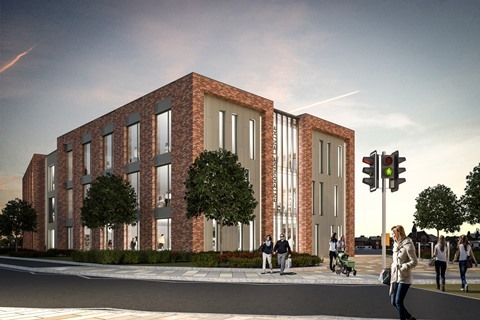 The building will include: 32 offices, of different sizes, to suit a range of start-up and small companies; two meeting rooms; a reception and shared lobby area; facilities for staff working in the building including kitchenettes, break out spaces, showers and a bicycle store. Councillor Terry Gilby, Chesterfield Borough Council’s cabinet member for economic growth, said: “These plans are a vital piece of the jigsaw in the Northern Gateway scheme and we know from the enquiries we get from start-up businesses how much this type of office space is needed in a town centre location. “Like our existing innovation centres at Dunston and Tapton this centre would be designed as a place that start-up or new businesses can let on ‘easy in-easy out’ terms with a view to them growing as businesses, expanding and moving in to larger premises in the borough. The proposed new building has been designed by Chesterfield-based Whittam Cox Architects and is being supported by funding from the Sheffield City Region Investment Fund. If the Enterprise Centre plan is approved it will mean the loss of 60 of the 255 spaces on the Holywell Cross (Donut) car park. However, these spaces will be replaced by the extra capacity on the neighbouring Saltergate multi-storey car park, which is being built alongside it. Saltergate will also have capacity to cater for the existing needs of residents, as well as the visitors who will use the Premier Inn. The Holywell Cross car park will remain open during the construction of the Enterprise Centre.